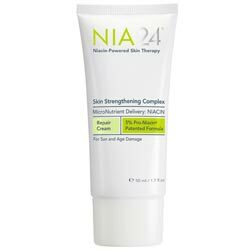 Nia24 Skin Strengthening Complex Review: Is It Suitable For Your Skin? Nia24 Skin Strengthening Complex which sells for US $93.00 for every 50 mL content is made from a wonderful fusion of skin moisturizers led by hyaluronic acid, antioxidants, led by Niacinamide and Vitamin E, as well as barrier-protecting ingredients, including ceramides and aloe vera. Made with peptides, apple fruit extracts, you can expect to see a better and more even toned skin with a silkier, softer texture that brings out the best skin you’ve ever had. Nia24 Skin Strengthening Complex is recommended for twice daily use, for best results. Apply liberally although just a small amount to cover the surface of the skin on your neck and decollete should be enough to deliver beneficial results. This product is not intended for use around the eye area which can become easily irritated with this product. Product contains butylated hydroxytoluene (BHT), a suspected endocrine disrupting chemical, which means that it can affect the otherwise normal functioning of organs in your body that are regulated by hormones. The best skin that you’ve ever had — Might Nia24 Skin Strengthening Complex be the right product to give you that? Perhaps but, don’t forget that your skin type and your most pressing skin requirements should always be part of your consideration. Buy or not, it’s up to you.